Your business is collecting massive amounts of data every time a customer makes a purchase or an employee performs a task. Business partners you work with (including Google and Facebook) are also collecting data all of the time. By 2020, 1.7 megabytes of new data will be created every second for every human being on the planet. With BI (Business Intelligence) tools, you can convert data into actionable insights for your business. From Human Resources to customer service to the supply chain, there is virtually no area of business that cannot be improved through BI. 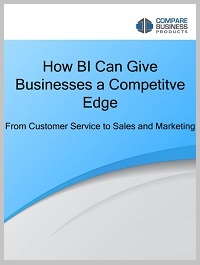 Increasingly, BI is necessary to remain competitive in your industry.